Anyway. 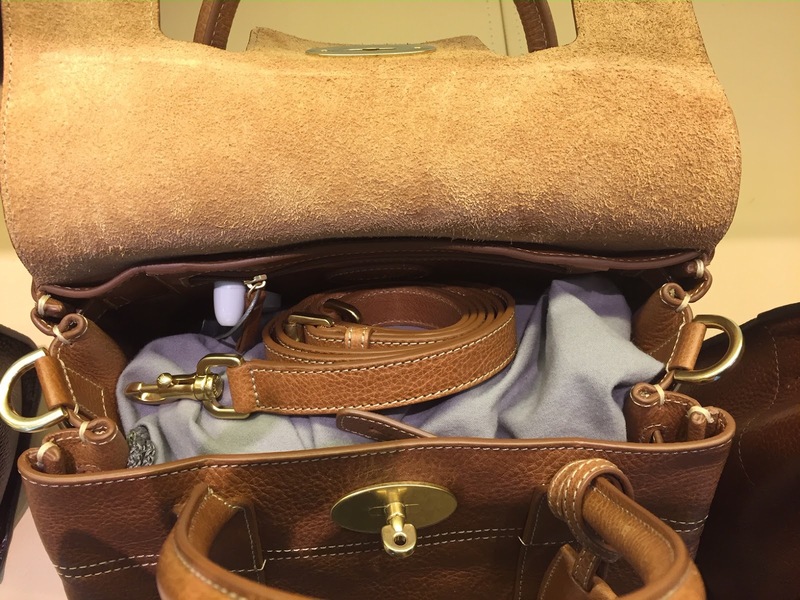 Our beloved Mulberry Bayswater had a makeover - as had her little sister the Small Bayswater Satchel. I thought I'd do a comparison between the classic SBS (which in itself is a made-over Ledbury) and the Small New Bayswater. Very comparable as you can see on the pic. SBS H16, W26, D14. Handle drop 8cm. SNB H21, W26 - 33, D13. Handle drop 9cm. I would guess that they are listed with a 5cm height difference because the SBS is much slouchier and was probably measured in it's slouchier, un-stuffed form. You can see here though that they are pretty similar. Looking at them from the side, is where you'd notice the biggest difference in re to size: whilst the SBS is deep at the bottom, the straps pull it together at the top. Of course, you could just undo them but I think most people leave it like this. The SBS is quite slouchy. This is partially due to the leather, partially due to its construction. (More on the leather later.) The main difference in construction is how the bag's "body" and side panels have been joined. In the SBS the leather is folded in on itself and then piping (re-inforced leather tubes) is sewn to the edges before it is joined onto the other panel. For the Small New Baywater the edges are essentially sewn on top of each other and have then inking applied for protection. You can see this in the above picture. This technique was used on quite a few vintage Mulberry bags I've seen, e.g. the Kelly or the Roxanne. SBS in classic NVT Oak: quite soft, varying grain as it "retains the individual grain pattern of the skin", matte. The inside is unlined, so you get the brushed underside of the leather. NSB in Oak Natural Grain Leather: sturdier, even grain as it "has been print assisted to make the grain consistent and regular". ("print assisted" - seriously?! ), more sheen. Suede lined. The SBS has brass hardware, which is fairly matte, so it looks a bit more understated than, for example, soft gold components. It is also less prone to scratches. 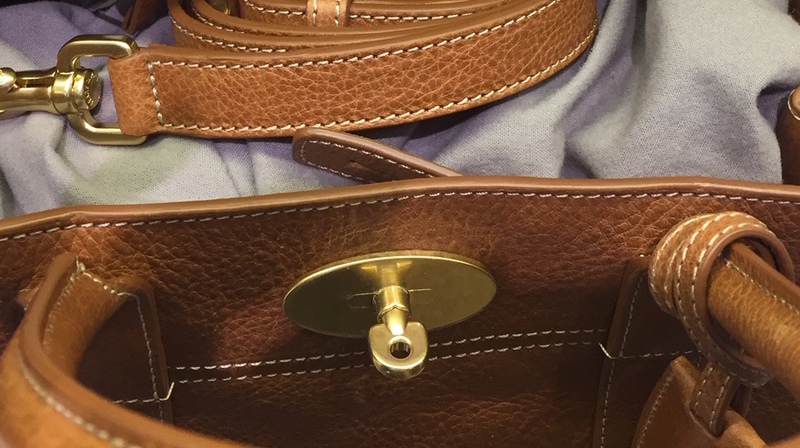 The postman's lock is made up out of the lock plate, on which the actual lock sits, and the top plate, which covers the inside and outside of the leather flap that closes the bag. The lock is pretty sturdy and the lock plates protect the leather/suede from getting grubby too quickly. On the top lockplate, we have the tree embossed above the hole, i.e. you will see it right above the turnlock when the bag is closed. Both bags come with a shoulder strap but the SBS' strap delivers a bag drop of up to 67cm, whilst the NSB's bag drop only measures 47cm. On the SBS the d-rings are attached directly to the top of the side panel and rub a bit on the top flap. On the SNB they have been re-positioned in such a way that they no longer rub on the flap. On the new model, the inside pocket has been moved into the front, which makes it more easily accessible. Another change is that there is no longer a cloche. 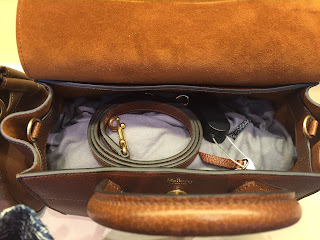 Oh, and as I said above, no longer a belt to make the bag bigger or smaller. As I prefer boxy bags, I like the sturdier leather and more structured design of the Small New Bayswater - even if I think the SBS just looks prettier. Ditto on the belt: I like how it looks but the unfussier and roomier version without it, just works better on a practical level for me. The re-positioning of the internal pocket is also a simple but well thought out change. Oh, and last but not least, I think the way the d-rings have been re-positioned is clever. The Mulberry cloche is a quirky and cute design feature but I usually end up moving it somewhere where it doesn't annoy me, so I'm not too fussed about that going. 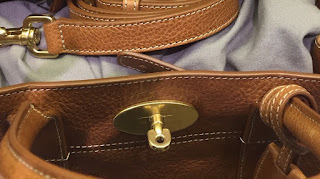 Likewise, I liked the fobs on the inside, as they help me identify a genuine bag (or rather: spot a fake on many occasions) but I have no doubt that other features will soon become apparent that will allow us to do that. What is the story with the new hardware?! Shine aside, the colour just looks cheap, too yellow. I prefer the more discreet tree logo to the "Mulberry" lettering. The lock mechanism feels flimsy, the absence of the lock plate makes me think that the suede there will just wear really quickly. I much prefer the look of the classic NVT Oak: it has real character and looks natural. There isn't much "natural" about the new "Oak Natural Grain Leather": the grain is embossed, the colour looks more ginger than natural leather. A big disappointment is for me the length of the strap. Truly good design is where function leads the fashion and this has been applied in a number of things mentioned above. Why not make this now even more practical bag suitable for cross body carrying? These extra few centimetres of leather would have made a huge difference but they are probably the deal breaker for me. Well, I hope the SBS will stay for a while and even if it will disappear out of main stores, that the outlets will continue to carry it, much like they've done with the likes of the Mitzy and the Somerset. Which bag can hold more? Your blog is timely because I'm investigating my next bag purchase and I think it might be one of these. How would you compare these to the LV speedy 25 or 30 regarding how much they hold?